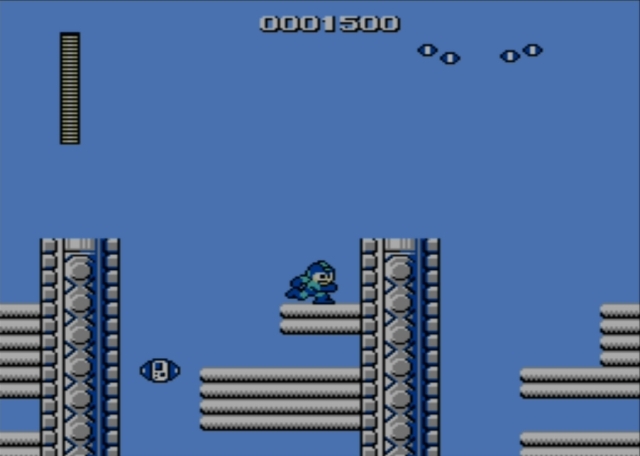 If you're having trouble with Guts Man, this stage is the ideal alternative starting point, since its hazards seem easier to avoid and the stage's guardian is a bit of a pushover. Star toward the right and you'll need to ascend along a series of ledges. Some enemies come springing toward you. They move quickly, but you can counter their speed with a barrage of bullets that should eliminate most of them as you work your way along a few ledges. You'll soon come to openings you can jump across, but don't be hasty until you get a feel for how this area progresses. 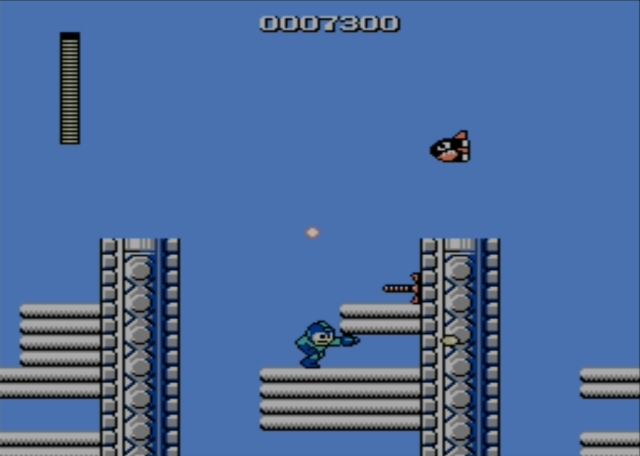 Enemies rocket up periodically, then break apart and drop as shrapnel. They can easily knock you into a pit if you move at the wrong time, while the shrapnel is hard to avoid if you're not expecting it. The easiest method for survival here is to push steadily to the right. The shrapnel doesn't hit you if you're clinging to the nearest wall, and then you have time to hop up and across the gap and keep moving right for another place of refuge. After crossing several such platforms, you'll need to slow your pace considerably. 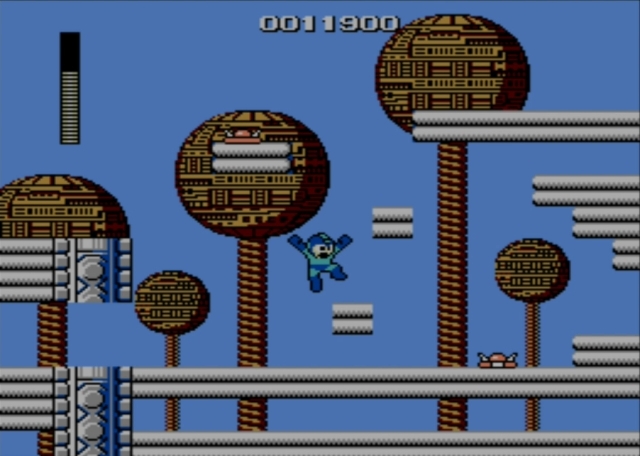 There are dark blue enemies positioned along the gray beams here, and at first they don't seem like a real threat. However, they emerge from their shelter as you approach and they fire spread shots. You can blast them with a few quick shots when they do, if you're at their level, but otherwise you need to pass between the pellets that make up their spread shots. 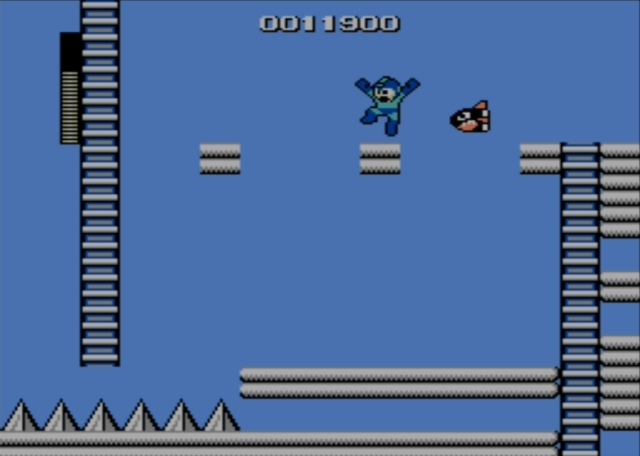 At the far right side of that area, ascend as needed to the top right area of the screen, where you can climb a ladder to the next segment. Here, you want to watch toward your left. There are four orange enemies positioned along a wall in that direction. They fire three shots in a row, retreat into a sheltered cocoon of sorts, then emerge with more malice in mind. Fire a shot left to eliminate the lowest one, and keep climbing to reach safety so you're not knocked from the ladder. 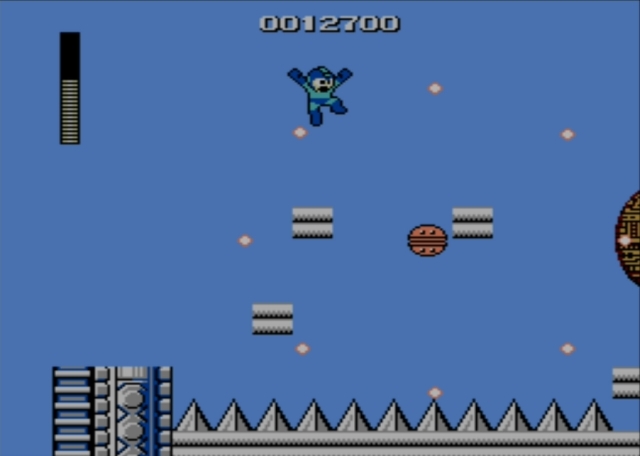 Then you can push left and climb out of the screen, or drop down for an energy capsule if you're running low on life. In the next screen, you seem to be alone. 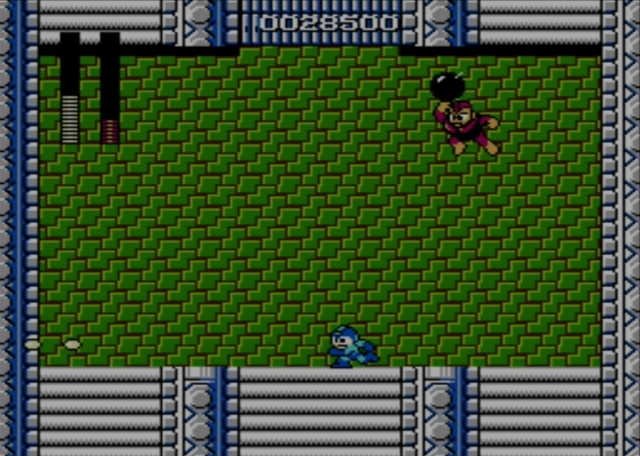 Head a short distance to the right, though, and an armored fellow in a green suit will bound in your direction. His shield blocks your shots, so you have to wait for him to emerge and then you can blast him a few times. Just know that he'll be returning fire. Sometimes, if you strike him after he leaps and just before he lands, you can also sneak in an extra hit. Further to the right, you'll find yourself advancing through an area with explosive birds and more of the armored wall cannons. 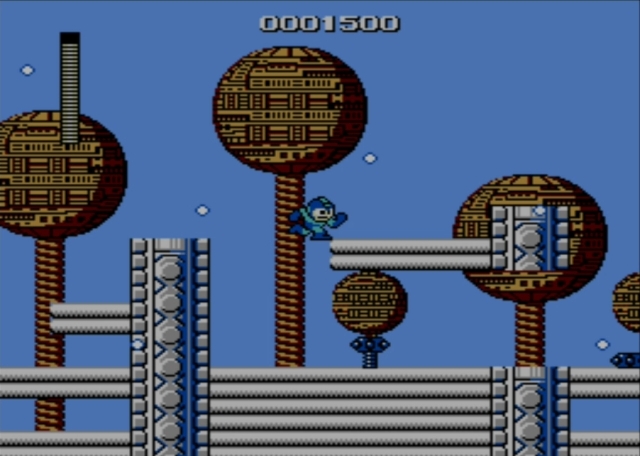 You can blast the avian robots with arm cannon shots to eliminate them in one hit, but be wary; they detonate when defeated and the blast radius could catch you and knock you into a pit. Keep your distance and eliminate targets before hopping across any gaps. In this manner, push toward more solid ground to the right. As you advance now, watch the low enemies along the platforms. They are armored and you can't defeat them with your arm cannon. A shot that connects will freeze them briefly in place, though, which you can use to your advantage. Otherwise, the trap-like robots zip toward you with speed that is difficult to counter (and which may knock you from the ledges they patrol, while dealing unwelcome damage). Past a series of such traps, you'll find a high ladder leading into another screen. To the left, you'll see yet another ladder, positioned over a bed of spikes. 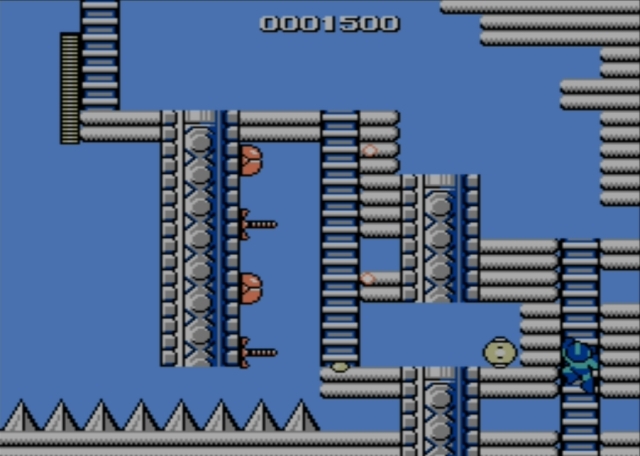 Birds fly in from the right and explode if you shoot them, as usual, so you're better off just avoiding a bird as you head left on its tail and then climb the ladder quickly and safely to the next screen. The next screen introduces another bed of spikes, this one much wider. An orange, pod-shaped enemy floats in the air and approaches quickly. As it does, it opens to reveal a weaker center, but also fires a spread shot that radiates around it and could knock you to the bed of spikes. That's a terrible fate, so avoid it at all costs as you hop carefully along the blocks that lead to the right. 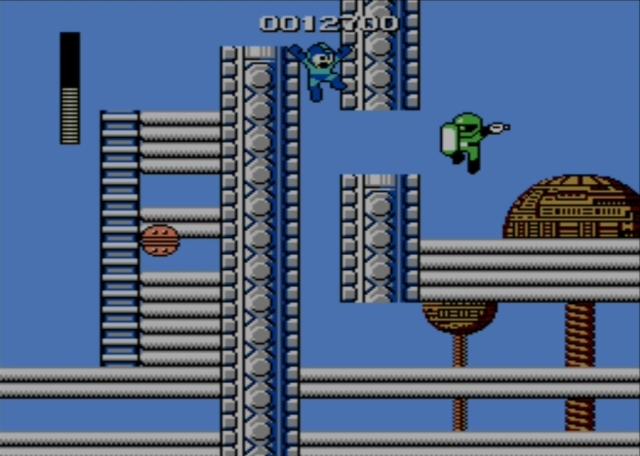 In that direction, past more of the flying pods, you'll find a ladder that leads to a high platform, and then you can drop down a narrow shaft with an opening to the right. If you hold right and pass through the opening, there's another green guy with a shield, who is guarding a rare 1-up icon. Take that risk if you like, but probably only if you have a lot of life left in your meter). Then drop down to the lowest level and head right again. On this lower level, you'll find yet another green guy with a gun. 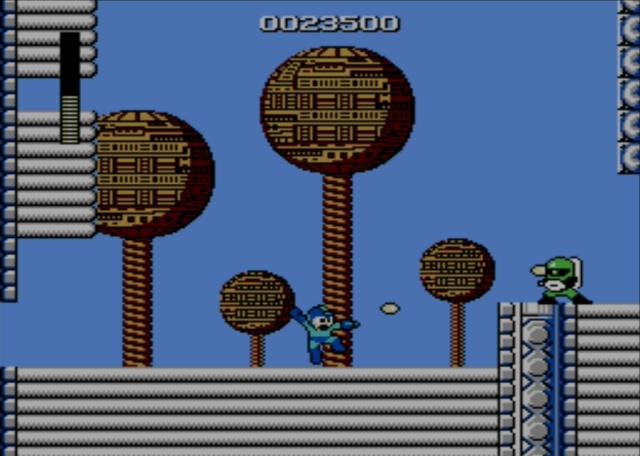 He's perched on a higher ledge, which makes it easier to jump and shoot him without risking damage of your own, but only if you have the timing right. Defeat him and pass through the gate to reach an area with a ladder at the center of a vertical shaft. As you descend, you'll encounter red enemies that look like eyeballs with suction cups on each of their four sides. They stick to the wall on the left, then cross over to the right, then return and so on. 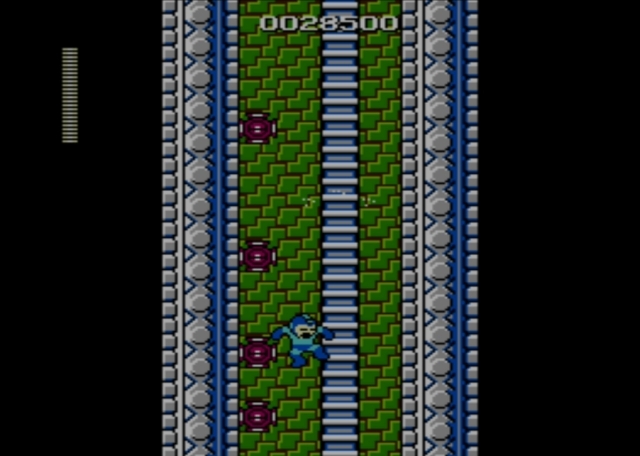 You need to descend carefully, or you can drop to the next screen (but be ready to cling to the ladder). Continue downward, avoiding more of these enemies, and finally you'll reach the chamber where the boss waits. 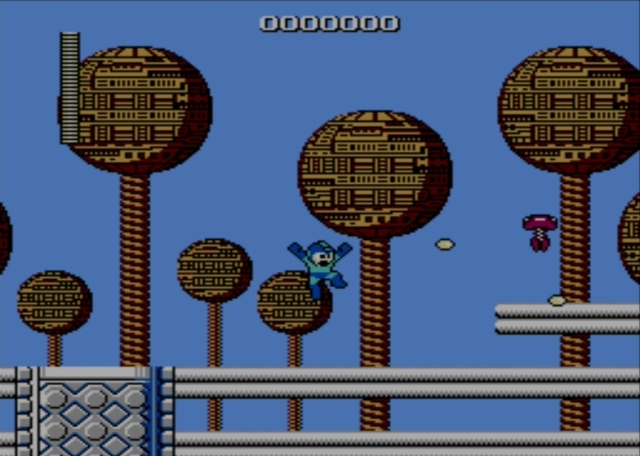 Your arm cannon is a great weapon here, and will quickly whittle down your foe's life meter. The main challenge lies in keeping your distance, so you don't choke on too many explosive blasts before you finish the job. 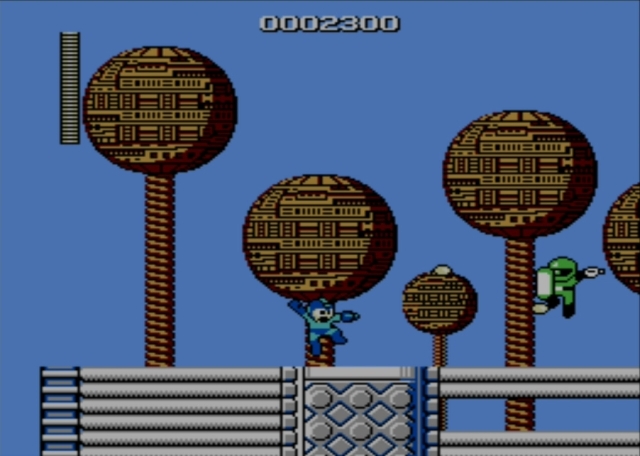 After Bomb Man first appears in the arena and his life meter fills, he'll likely take a small hop toward you. If you start toward him, you'll just run into him, which does more damage than is ideal. Once he has hopped, he will continue to hop, and soon should take a larger leap that carries him across the screen and probably over your head, so that he now is to your left. From there, he'll chuck a bomb a short distance. It explodes and does damage in a fair radius, so back away and then turn and fire any bullets you can as your foe rushes you. This simple pattern repeats fairly predictably throughout the fight. The main thing is to avoid small hops so you can safely fire a bunch of rounds at your opponent. You're likely to take damage throughout the encounter, but as long as you're firing a lot of shots that connect (easiest to do just after an explosive is tossed by your foe), you'll not be the one to run out of energy.